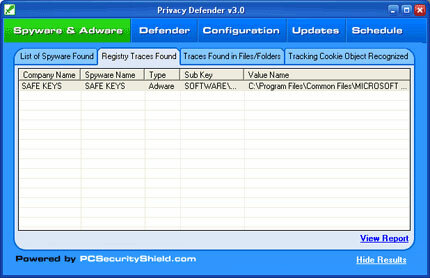 We have installed free version of Privacy Defender on clean computer and performed full system scan. The application has found Safe Keys adware program. The registry entry and directory associated with this adware were related to legitimate Microsoft Office component Smart Tag, which is safe and cannot harm the system. Free version refuses to remove any objects it found and asks to purchase full product. Memory Shield/Alert function should provide realtime protection from spyware running in the memory. On our test system it reported that mIRC chat program is running and asked to leave or terminate it. mIRC is legitimate and shouldn’t be treated as suspicious software. We have installed Claria adware to the test system. The installation process and running adware were not detected despite that Memory Shield/Alert was enabled. Screenshots provided below prove that Privacy Defender uses false positives. The official site is pcsecurityshield.com. Another associated resource is threatlevel.com, which offers free online scan. We have tested the system with installed antivirus software, antispyware programs and a firewall. Scan results showed that our computer lacks any virus protection software. It appears that online scan doesn’t work correctly and was designed to trick users into purchasing Privacy Defender. 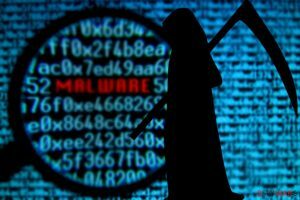 Program’s interface is very similar to those found in several other antispyware programs. The application uses same spyware definitions database and produces similar scan results. 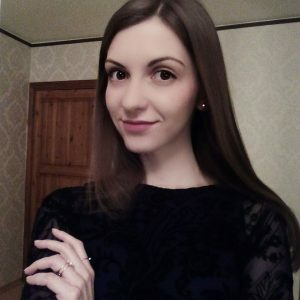 It is a clone of MySpyFreePC, SpyBlocs and iSpyKiller. This entry was posted on 2014-05-15 at 15:20 and is filed under Corrupt Anti-Spyware, Software.